Sal has decided to take matters into her own hands. She's planned everything meticulously, and gathered knowledge and equipment over many months. Then she killed her mother's abusive boyfriend and ran away to the woods with her sister. Determined not to let anything split them up, Sal deploys remarkable survival skills and a resourcefulness that belies her tender years to start a new life with Peppa in the rugged landscape of Scotland's Galloway Forest Park. She's learned all about building a shelter, starting a fire, hunting, fishing and countless other things from YouTube videos and her trusty SAS Survival Handbook. Now the girls just need to bide their time while their alcoholic mother goes through rehab, then they'll fetch her and all live together in this silent wilderness. But before they can carry out their scheme, they meet their "neighbour" Ingrid, a reclusive immunologist who lives in a rustic camp a few miles away and must deal with wounds of her own. She teaches them about baking bread in a stone oven, making bowls out of birch bark, communing with the Goddess and the importance of forgiveness. This encounter will have a profound effect on all their lives. Switching between present circumstances and past events, Sal tells us her story in a very matter-of-fact way. She's extremely bright, despite being placed in a vulnerable learners programme at school owing to her severe dyslexia and unsatisfactory social skills, so it's fascinating to see "from the inside" how she deals with hurdles that would defeat many so-called well-adjusted adults. The subtlety with which nature as a source of healing was treated is another highlight. 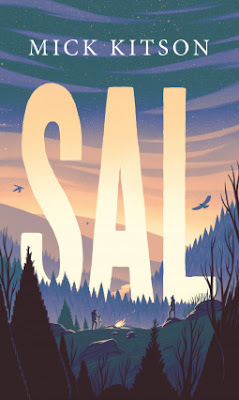 Since I've always enjoyed fiction where people must cope with fulfilling their essential needs in strained circumstances, "Sal" was right up my trail, as it were. In that regard, if I may offer a vegan's perspective on the measures Sal must take in order to feed herself and Peppa, I appreciate that the author didn't shy away from the realities of taking an animal's life, but also didn't try to ennoble the act, for example by having Sal thank the animal for its sacrifice or "honouring its spirit" in some way. I found this novel extremely compelling and moving. All of the characters felt completely believable, and I thought it offered an excellent portrayal of girls' and women's strength. I couldn't recommend this book highly enough! I was provided with a free electronic copy of this book through NetGalley by the publisher, Canongate Books, in exchange for an honest review.